cosmetic phase A: the oily base, which includes vegetable oils in liquid or solid form, such as sweet almond oil (liquid form) or shea butter (solid form), or even oil in which we have extracted herbs (herb oils), beeswax or other types of wax such as carnauba wax, emulsifying waxes and other fat- soluble ingredients. cosmetic phase B: the water base, which includes water, floral water, herb tea, infusion, aloe juice, other water extracts, water soluble ingredients, powders such as allantoin or caffeine or xanthan gum, vegetable milk such as coconut or hazelnut milk but also animal milk, such as donkey or goat milk. cosmetic phase C: once we have prepared the cream/ lotion. milk/ body butter base, in this phase we add our active ingredients such as hyaluronic acid, elastin, collagen, vitamins, natural preservatives, elixirs, herbal and sea extracts etc. 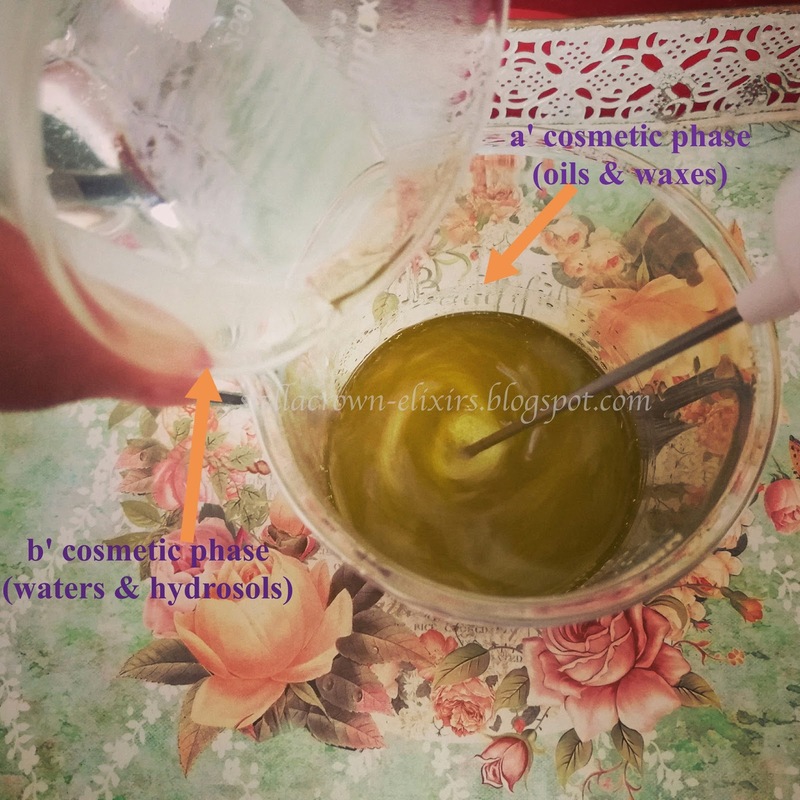 cosmetic phase D: in this phase we add the essential oils, also active ingredients, which they offer not only their scent but also plenty of healing properties. As I wrote above, the emulsifying agents help the integration of oil and water base. 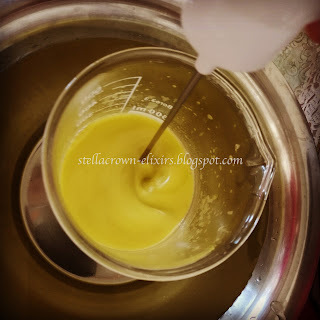 All kinds of natural waxes, from beeswax and carnauda wax the notorious emulsifying waxes, are emulsifying agents. You should pick the e- waxes only if you find them as derivatives of natural oils that have been mildly processed. Many recipes with borax can be found on line. Sodium tetra borate a.k.a. borax is a kind of salt that is found mainly in salt lakes and is harvested like sea salt. Many people confuse borax with boric acid, which is a completely different ingredient. Boric acid is an excellent ingredient to make natural household cleaning products, but not for your cosmetic creations. Lecithin is another ingredient which is used in many foods as an emulsifying agent and is sub- product of soy flour and oil production. It is a clean and non- allergic ingredient. Stearic acid is broadly used for emulsification. It is saturated fatty acid whose name comes from the greek word “στέαρ” which means “fat”. It is considered as one of the most common fatty acids and it is found in animal fats and vegetable oils; the one I use, in specific, comes from coconut oil and shea butter. Many food products contain steric acids, such as confectionery fats, margarines (which I don’ t use for other reasons), cheeses and pastries. A safe substance to use in foods and cosmetics. pouring oil into water or water into oil? 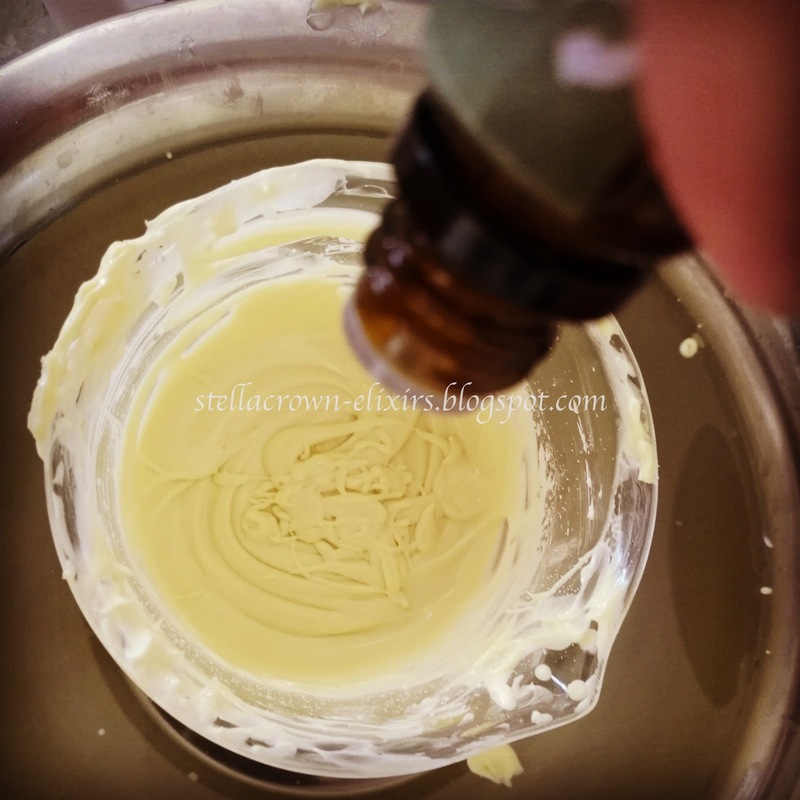 When we pour the oil base into the water base, we will get a cream with a heavier and thicker texture. The oils dominate in this case and create a protective film, locking natural moisture onto the skin. This method is appropriate for products for dry and mature skin, usually including body creams, hand creams, night creams, body butters etc. 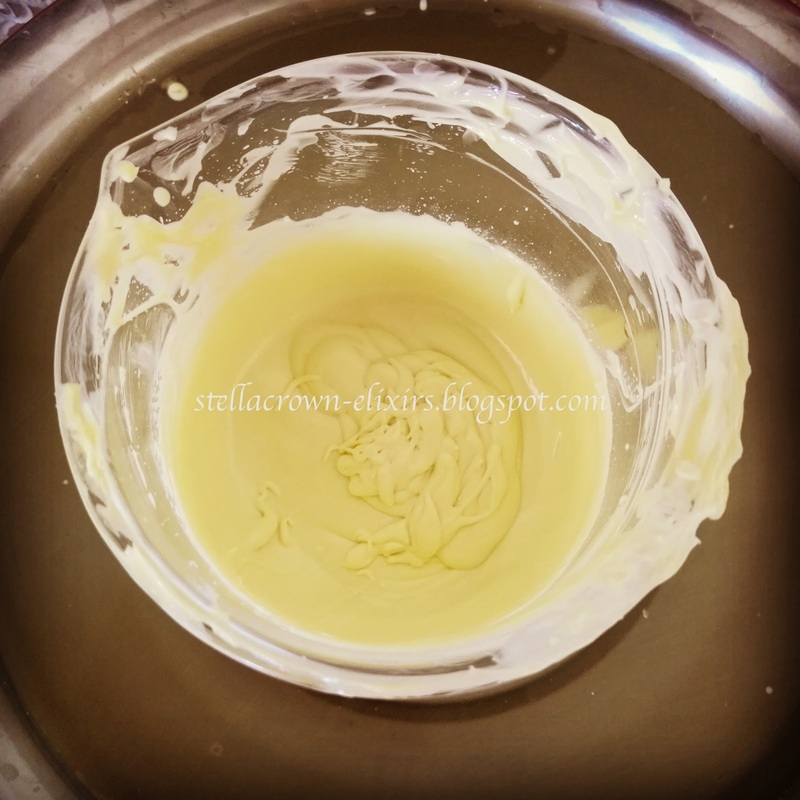 When we pour the water base into the oil base, we will get a lighter cream with less thick texture. In this method the water elements dominate and we create products that allow the skin to breathe without clogging the pores. An ideal method for milks and lotions, ideal also for me and my oily skin. Preservation can be a headache, especially during the hot summer months. Preservatives are essential to the creams and in any cosmetic product that contains water, because they prevent bacteria and fungus growth, thus extending the life span of a handmade product. To avoid oxidation and/or holding, we have vitamin E (tocopherol), rosemary extract, grapefruit seed extract and the fridge at our disposal. In addition, all cosmetics raw materials providers have several preservatives available, and the ones I suggest are those which do not contain parabens! The preservatives that contain alcohol also do a good job, but I leave this up to you. All essential oils also act as natural preservatives, however the quantity used in a cream is not enough to protect it effectively. Before we start making our product, we sterilise our tools, containers and work surface. Tools and containers can be perfectly sterilised in the dishwasher an once we take them out, we spray them with pure alcohol. We use alcohol to sterilise our work surface too, while always wearing gloves. 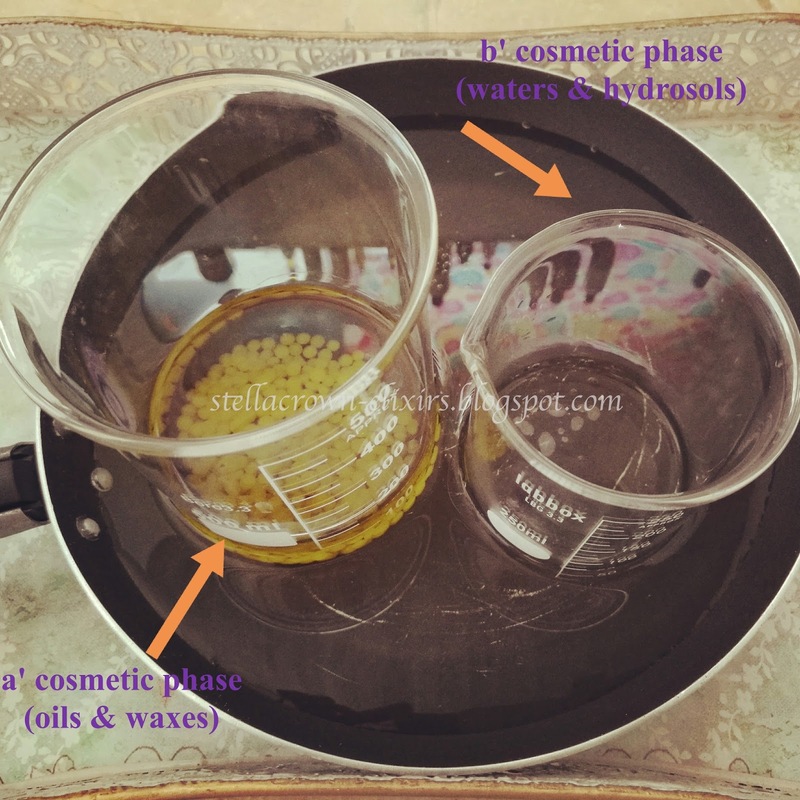 We put our oil base (cosmetic phase A), meaning the beeswax, emulsifier, vegetable oils, lecithin (if mentioned) etc in one beaker. In the other beaker we put our water base (cosmetic phase B), meaning the floral waters, glycerin, aloe gel, allantoin, other water- soluble ingredients etc. We fill the pan with water up to 1/3 and add a bit of vinegar to avoid scale formation. We place in it the two beakers and heat it up at low temperature. Waiting for the waxes and oils to melt, we mix thoroughly to homogenise and melt the mass quicker. At the same time we are heating up and mixing our water base. After a point the two electronic thermometers will help. Careful, I do not want the temperature of the contents to exceed 69°C. We remove utensils from heat. We add the fat- soluble and water- soluble ingredients (wherever mentioned) to the oil and water base respectively. Attention: you can leave the active ingredients, fat-soluble or water-soluble, to be added in cosmetic phase C, once the cream cools down. We unify the two procedures: we pour the oils into the waters or the waters into oils, depending on the cream texture we want to achieve. If we used beeswax only, we pour one base into the other gradually and slowly, while mixing thoroughly with the coffee mixer. If we used even a small quantity of e-wax in the recipe, we pour one base into the other at once and mix. We place the beaker with our mixture into the bowl with room temperature water that we have already prepared, while continually mixing. In this way we help our cream cool down and set faster (careful: we don’t fill the bowl to the top as we don’t want the water to get into our cream while we are sinking it). We mix for 3 minutes and stop. We continue mixing thoroughly using the whisk. We stop after 3 minutes and continue with the coffee mixer. We repeat until we achieve the texture that we want. Once the cream has set and cooled down, we add the active ingredients and our preservative. We mix again thoroughly. Finally we add the essential oils and continue mixing. Always remember that the key to success is in good mixing!